Update 7:15pm: Thankfully we didn’t receive as extensive of severe weather as was expected, which is ALWAYS a good thing. There wasn’t enough instability (aka CAPE) in the atmosphere for the storms to interact with, limiting their severity. 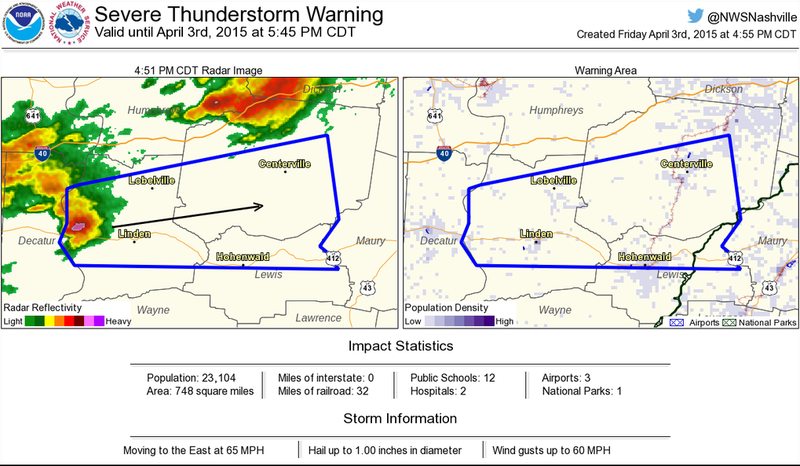 Southern Hickman County, including Centerville, did receive a Severe Thunderstorm Warning today between 4:55pm and 5:45pm today, as depicted below. The Lyles/Bon Aqua community did see some rough weather from a non-warned storm (separate from the one above – you can see it in the top northwest part of the county in the graphic above). The potential for hail was there, but none was reported. This storm later went to Fairview where a warning was issued. 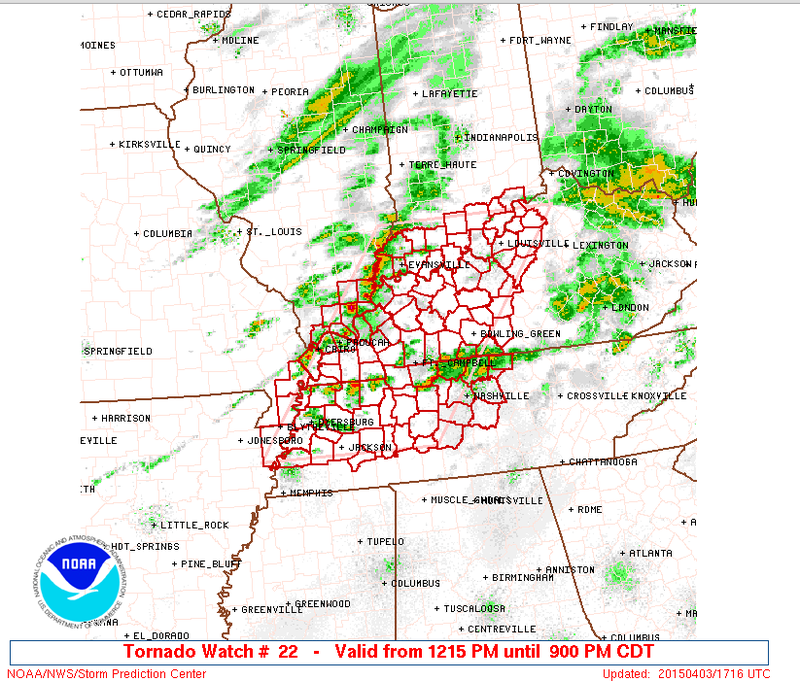 The NWS did cancel our Tornado Watch early, at about 6:45pm today, signalling the end of the severe weather. The wind though is still very strong out there, even more so than before the storms. We are still under a WIND ADVISORY until 1am Saturday morning. Update 3:30pm: Starting to see storms fire up to the west along the cold front. Another storm is making its way through Dickson County right now. 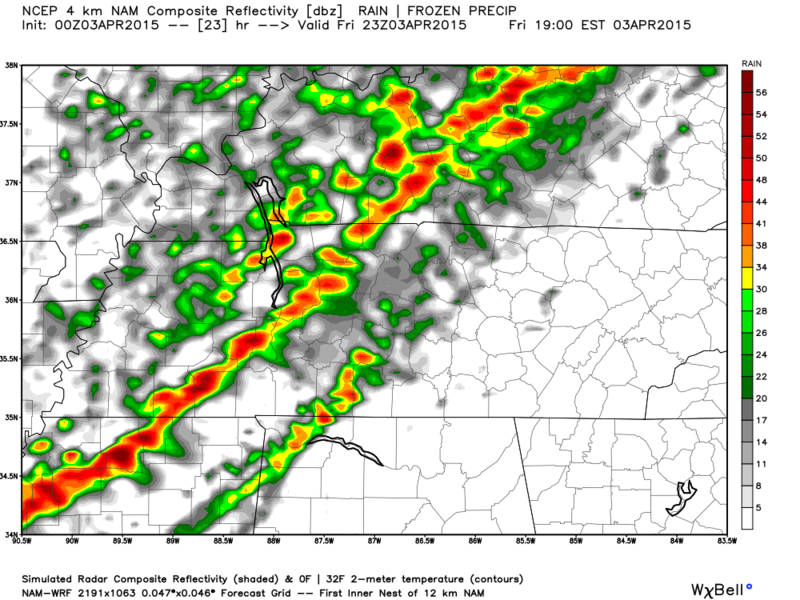 The HRRR model still wants to say we will see the front at about 5pm. I think that may be a little fast based on where the storms currently are, but we will see. Update 12:55pm: We’ve been placed under a TORNADO WATCH until 9pm tonight. Updated 11:45am: The SPC has increased our tornado probability to 10% probability within a 25 mile radius of a point. Still low but concerning. It appears the only changes they made was expanded the ENHANCED area a bit to cover more of Tennessee. The good news: They believe we will have a 5% probability of seeing a tornado within a 25 mile radius. This does not appear to be a tornado outbreak type of system, however it is expected that super cells ahead of the main line could be strong enough to produce a tornado or two. This system is mainly a damaging wind and large hail producer. There is a 30% chance of seeing 55+ mph winds within 25 miles of a point. Lastly, they believe there is a 30% chance of seeing one inch hail in diameter or more within 25 miles of a point. 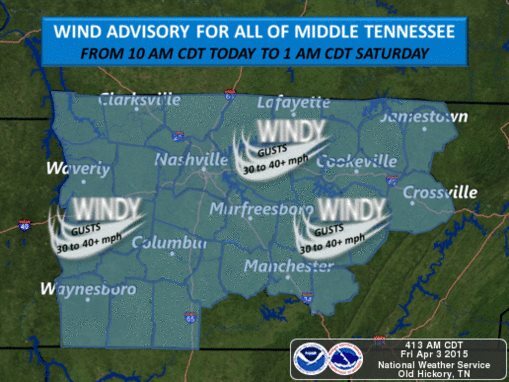 The NWSNashville has placed us under a WIND ADVISORY from 10 am this morning through 1 am Saturday morning. With gusts up to 40+ mph without a storm, they are concerned about some property damage, trees down, or power lines down due to the wind. To sum it all up, the NWS expects damaging winds to be the main threat, followed by large hail, then tornadoes, then flooding. Now for the models. 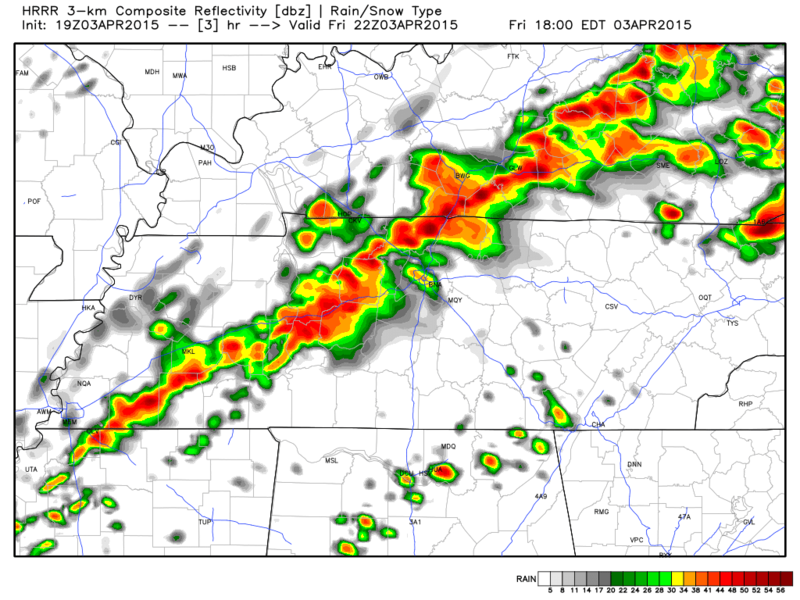 The HRRR model believes some supercells could develop ahead of the main line. 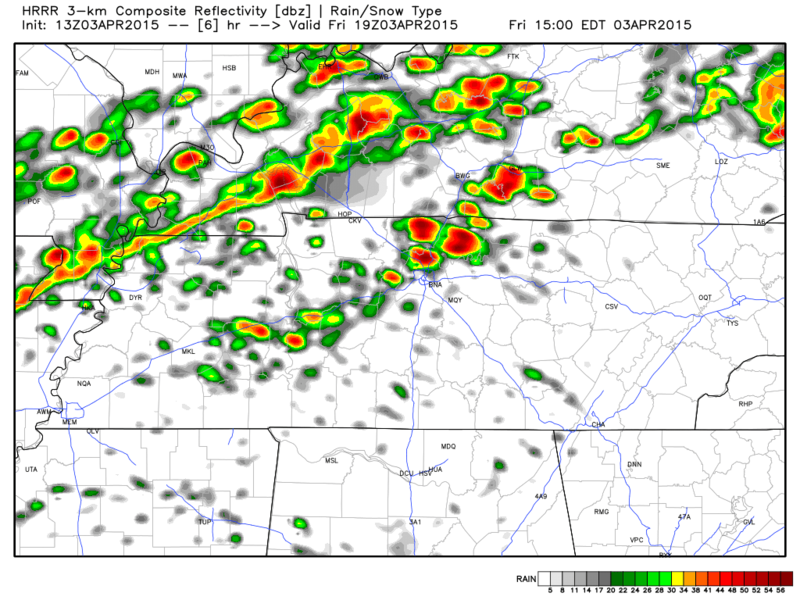 Here is the latest HRRR model run for 2pm today. 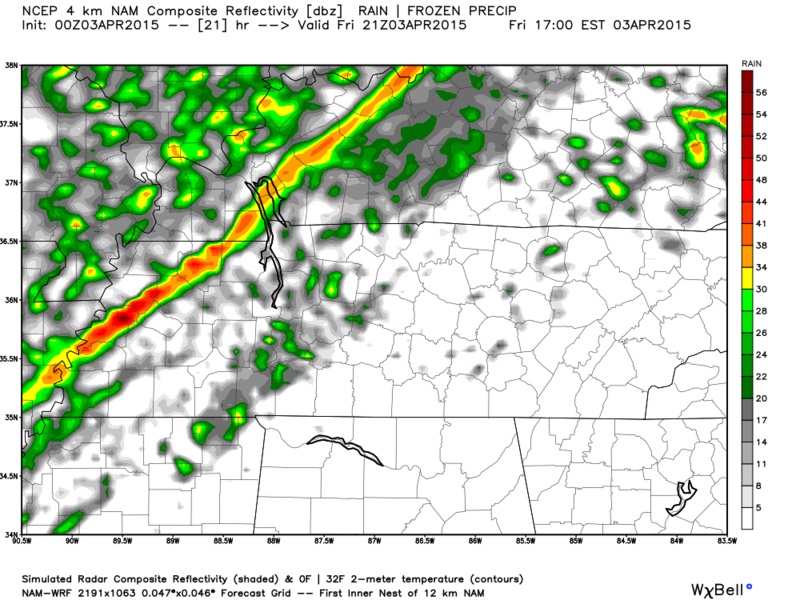 The main line is expected to come through at about 6pm for Hickman County, according to the HRRR. 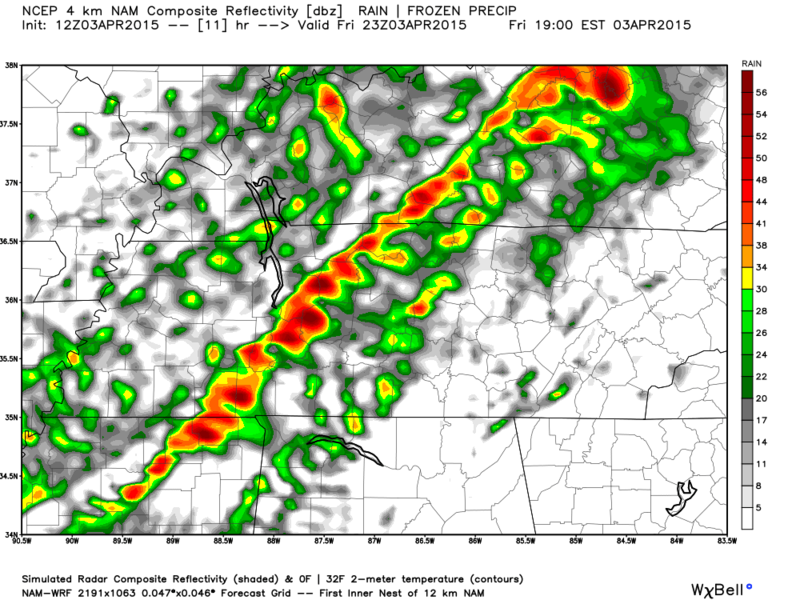 The NAM4 model is showing the timing of the main line as 6pm as well. We will be watching as these storms start coming through and will be sending tweets out if severe weather starts impacting Hickman County. We will update this post accordingly during the day Friday. While I will refer to this post many times tomorrow, latest updates will be on top! Our TWITTER account will take priority over updating this site. Make sure you have weather alerts activated on your phone and that your weather radio is operating. 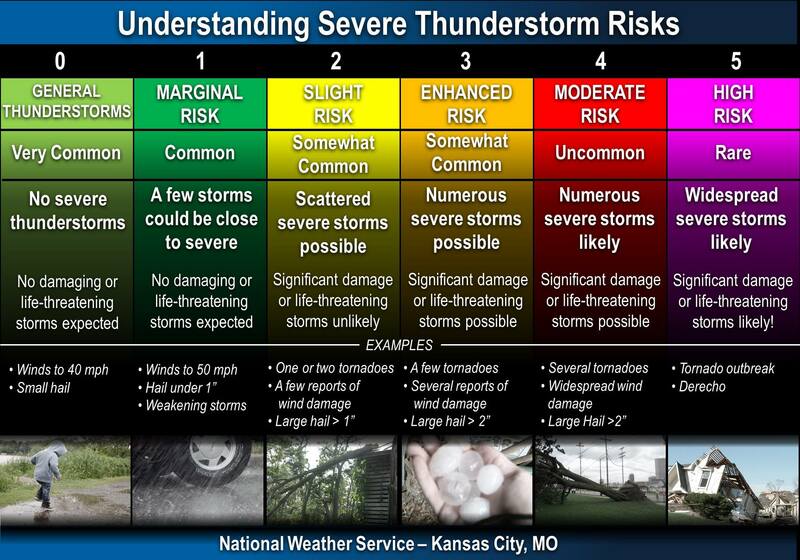 Read our page about Severe Weather Preparations to get prepared for any severe weather today. Summary: SEVERE WEATHER EXPECTED Friday as a cold front comes through. Be aware and alert! 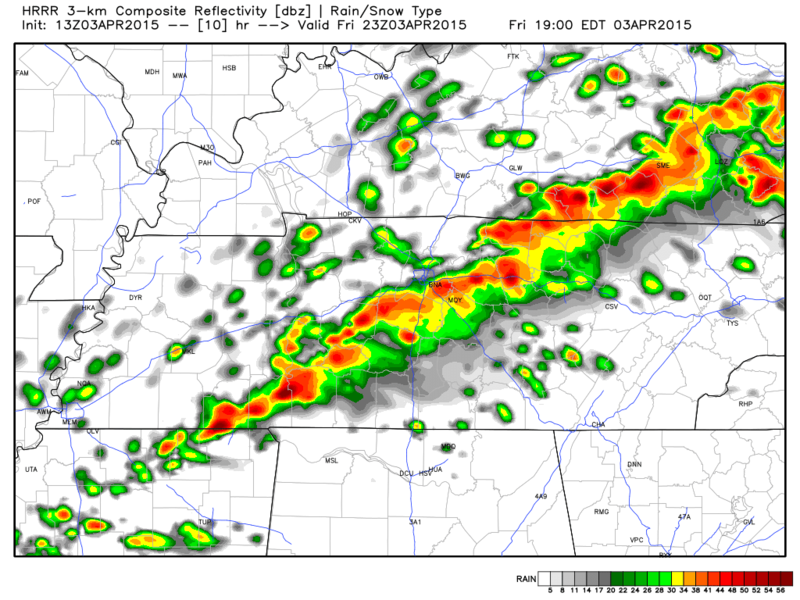 Friday will be a very eventful weather day across Middle Tennessee. We will be getting our first real taste of the 2015 severe weather season today as a very powerful cold front pushes our way, setting off storms and severe weather as it interacts with the current warm, moist, and unstable air in place. Today will see an 80% chance of rain with a high temperature likely reaching about 75 degrees before the cold front arrives. Winds will be very gusty from the southwest at about 15-20 mph, with gusts up to 25 mph. 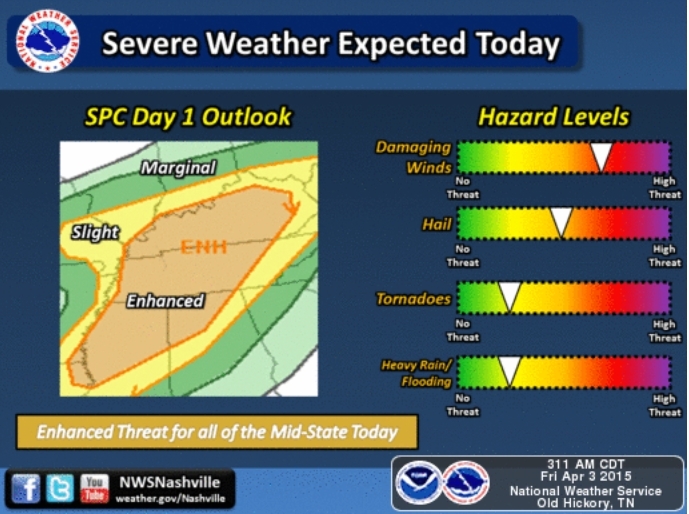 The SPC has us under an ENHANCED outlook today for severe weather. They also have us under a 30% chance of significant severe weather today. Probability of severe weather within 25 miles of a point. Hatched Area: 10% or greater probability of significant severe weather within 25 miles of a point. The SPC has this to say about today’s weather outlook. TENNESSEE VALLEY INTO A PORTION OF THE OHIO VALLEY. The main threat with today’s storms appear to be straight line damaging winds and large hail. However, in Tennessee, when a cold front comes through the area in the spring and fall months, tornadoes cannot be completely ruled out of the forecast. It is actually expected that a few storms could strengthen enough to produce a tornado ahead of the main squall line, but this will not be a tornado outbreak severe weather event. 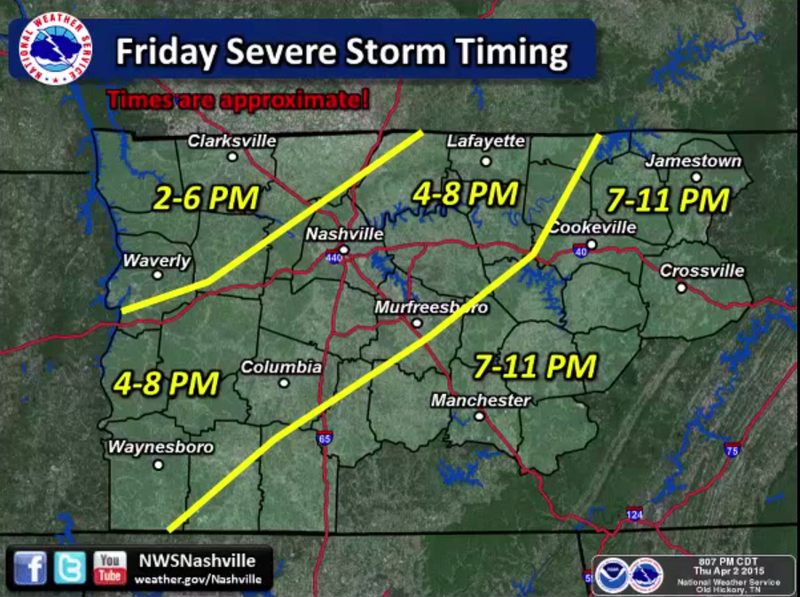 Here is NWSNashville’s timing approximations. Current weather models (as of 10pm Thurs, April 2) are showing one wave of storms at about 11am this morning. 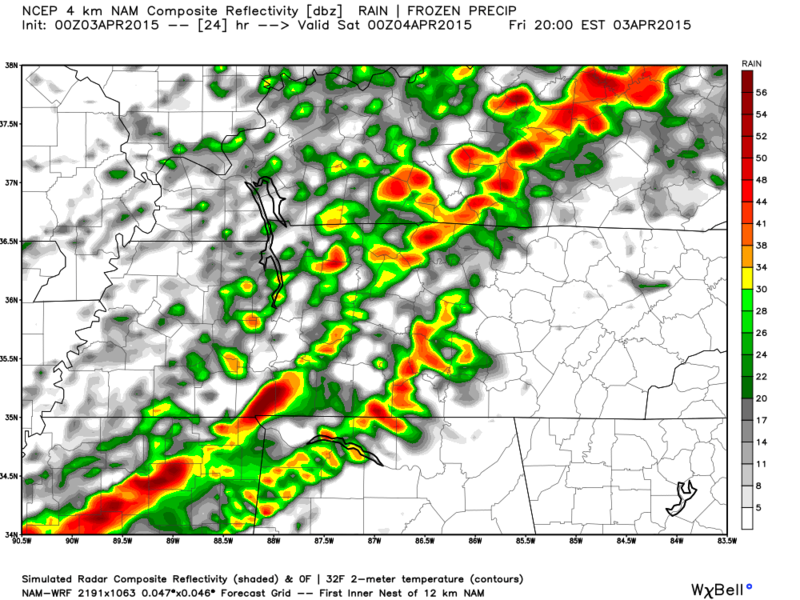 Below is the HRRR model. If this happens, it could produce super cell storms ahead of the likely squall line. This is a catch-22: while we want some rain to help stabilize the atmosphere, we don’t want super cell storms. As for timing of the main line of storms, below is the latest thinking from the NAM4 model at 4pm. And finally, NAM4 at 7pm. Don’t get caught up in the placement of the large, darker cells on these model images. This is not an indication of where the worst storms will be. Take from these graphics the fact that a line of storms will be developing and moving through. All severe weather should be out of our area Friday by midnight. However, it will be VERY windy behind the front, so NWSNashville is already considering a wind advisory for Friday night/Saturday morning, just as a heads up. Trained spotters are encouraged to call NWSNashville directly to report severe criteria events in a timely manner, when it is safe to do so. 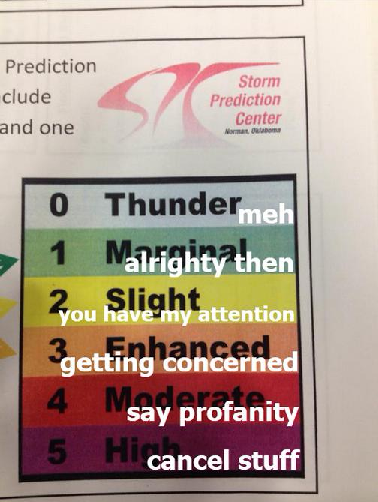 Call the number given in your storm spotter class. If you are not a trained storm spotter, but see any of the following events happen where you are, please tweet at us using the hashtag #tspotter and we will relay this information to the NWS. NWSNashville (and us!) monitor this hashtag for storm reports. Tweet time event occurred, what event you saw (see list below), and where you saw it (your best description of location – i.e. 3 miles NE of Centerville). Pictures are also super helpful ONLY if it is safe to take the picture. To report hail size, please relate to common size items (pea, penny, nickel, dime, quarter, ping pong ball, golf ball, baseball, etc.). REPORTS FROM TRAINED WEATHER SPOTTERS MAY BE NEEDED. Easter weekend still looks good. We’ve been focused on the severe weather, but we will be rewarded with a nice holiday weekend. Friday night’s low will be around 43 degrees as the cold front pushes all the wet weather out of here. Saturday will be sunny but a bit cooler with an high of 61 degrees. Winds will be coming out of the north at about 10 mph, making it feel cooler than 61 degrees. The ground will be soggy so be prepared for mud. Saturday night’s low will dip to about 37 degrees. It is possible to wake up Sunday with some patchy frost on the ground. Sunday is looking picture perfect for all of the Easter egg hunts. We are looking at partly cloudy skies with a high about 66 degrees, but will feel warmer because winds will be coming out of the south at about 5-10 mph. 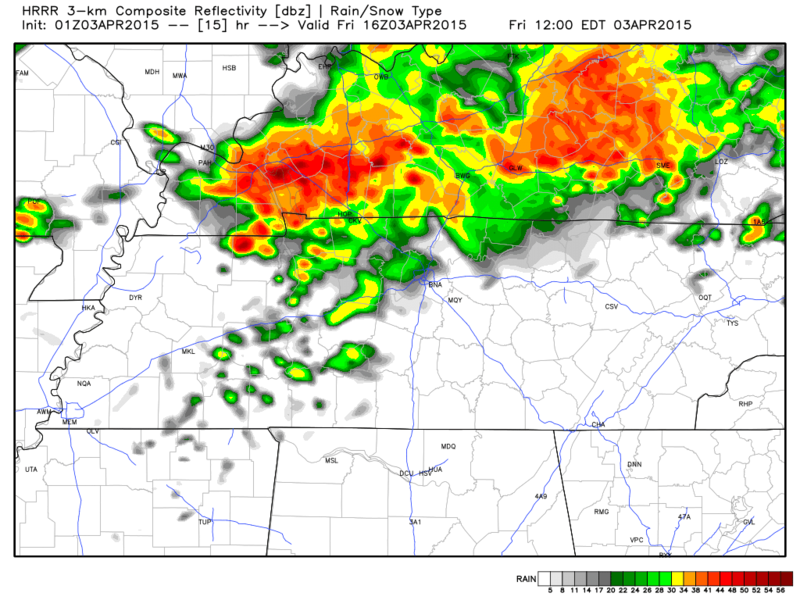 Not to ruin the weekend, but storms enter the forecast again come Monday. I know, we aren’t thrilled either. After this round of severe weather is done, I will start discussing the upcoming work week’s weather.